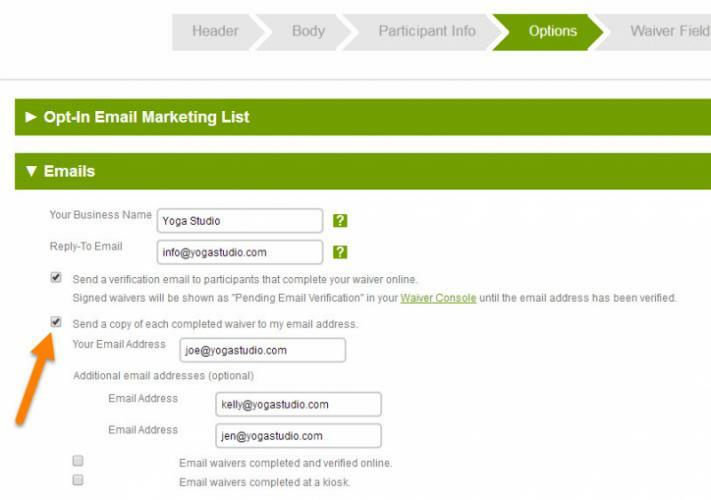 Through the Waiver Editor settings in your waiver, you can send copies of completed waivers to up to three email addresses. 1. Go to the Waiver Editor and edit your waiver. 2. Select the Options tab > Emails. 3. Make sure that "Send a copy of each completed waiver to my email address." is checked. 4. Enter up to 3 email addresses to have a copy of your waivers emailed to each recipient. Are participants sent an email notification with a copy of the waiver after signing?